Former Inter Milan boss Erick Thohir is shading rivals AC Milan, which are keen on spending their way to success this term. Inter Milan used to be owned by the Moratti family. They owned the club from 1955 to 1986 and the second spell from 1995 to 2013. The then club chief Massimo Moratti spent €1.5 billion of his personal fortune to get high calibre players but his successor Thohir does not feel the same way. Thohir took over in 2013 as leader of Indonesian consortium International Sport Capital HK ltd to acquire majority shares from Internazionale Holdings. Inter became the first club in the Serie A to be sold to Chinese ownership when they agreed a deal with Suning Holdings Group in 2016. After the Chinese acquired the Nerazzurri, co-tenants at the San Siro Stadium AC Milan were bought by Chinese consortium named Rossoneri Sport Investment Lux this year. “If you remember, when I came into Inter Milan in 2013, we signed the Financial Fair Play. This year, we have to balance between buying and selling players. Inter are in transition,” Thohir argued. Christian Chivu has stated that Jose Mourinho is the best coach that he has ever worked with in his career. He played under him at Inter Milan, and he said that he is the best person when it comes to managing his players. He said that Mourinho knows how to motivate his players and that he knows how to make them play for him. Chivu said that the Portuguese manager knows how to talk to his players and make sure that they give their best on the pitch. He said that Jose Mourinho makes you believe as a player that you are the best in the world and that you can beat anyone. He said that it was very easy to play for a manager like this as he does not overcomplicate things. Is Christian Chivu interested in becoming a staff member? Christian Chivu announced his retirement from football on March of 2014, it’s been almost 3 years since that occurred and from there on out, the Romanian retiree has fallen out of the spotlight of the media which is a fairly thing that happens when a player decides to hang their playing boots. No news, rumors or anything for that matter emerges after a player retires but there has been something involving Christian Chivu which might suggest that Chivu could make a comeback to the world of football and possibly to the eyes of the media as well. Manchester United coach Jose Mourinho has accused the Red Devils set-up of commitment issues as the team struggles to make as much impact as expected this term. The Portuguese tactician is obviously frustrated at the players and called them out publicly of recent. “Smalling doesn’t fell he can play 100 percent with his pain. Shaw told me this morning he was not in the condition to play so we had to build a defensive line. There is a difference between the brave that will be there at any cost and the ones that a little pain can make a difference,” Mourinho said despite the victory against Swansea before the international break. WILL CRISTIAN CHIVU PICK UP COACHING? Retired 35-year old legend, Christian Chivu might pick up the managerial career after retiring from active football for sometime now. The Romania International was 22 years old when he appeared in the UEFA.com users’ Team of The Year in 2002. The talented left back left active football in 2013/2014 while paying for FC Internazionale Milano due to recurrent foot injury. “I would like to thank all the clubs I have played for, first for their trust in me and also because they have offered me the opportunity to develop and grow in various countries and cities, which helped me become a better person. “I thank all the supporters of the teams I have played with, as without their support and endless passion, our victories would not have been possible. I have always respected and honored the history and the tradition of all the clubs I played for. Roberto Mancini ended his managerial career with Inter Milan back in May of 2008 after the coach was able to win 3 successive Serie A titles as well 2 Coppa Italia and 2 SupercoppaItaliana. It took him 4 years to secure all of these pieces of silverware and this period of time was a memorable one for Mancini and Inter Milan as the Italian side was the best team in Italy. Things have slowly begin to fall apart for Inter Milan as they have struggled trying to win major titles in these past few years. Mancini was even called back as he made his return to the Giuseppe Meazza with hopes of turning Inter Milan into the dominant club that they once were some years ago. The 50 year old Italian manager is well aware that things have changed ever since he left Inter Milan and making a return to the club is a big challenge as there are many things that need to be done. “It’s not easy at this moment. It’s not easy because we are working very well, but the results are so-so, and, you know, Inter is a top club. The supporters want to win every game. At this moment it’s difficult, and this is a very big challenge for me. To come back to Inter is the biggest challenge,” Inter Milan’s Roberto Mancini said. Roberto Mancini’s return to Inter Milan has not gone exactly as planned as the coach who managed to win the Serie A title for 3 successive years with Inter Milan back in 2005 is now struggling trying to seal victories on a consistent basis. There only are 2 months remaining until the end of the Serie A and the champions of Italy are announced. Inter Milan is positioned in the 10th spot of the Italian League and it seems very far-fetched to believe that they will be competing in the Champions League in the upcoming season. Inter Milan’s latest results has seen them losing against Sampdoria while only being able to draw with Cesena and Napoli in their previous Serie A matches. 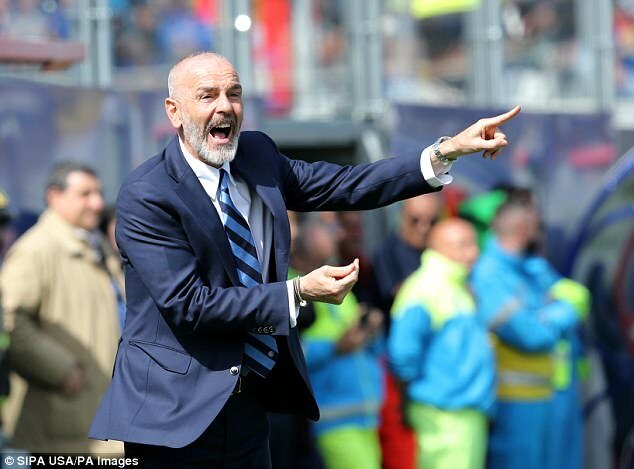 The Italian coach has admitted in saying that he did not know it was going to be this difficult but is confident that he return Inter Milan to their former glory days, however its going to take time to make it happen.